[Editor’s note:] Recently, CBCGDF’s volunteer discovered on the social media of a well-known company’s executive manager had eaten pangolin meat in Vietnam. The manager’s post was then reported by the volunteer from CBCGDF. After this incident was exposed, it triggered criticism from the society. 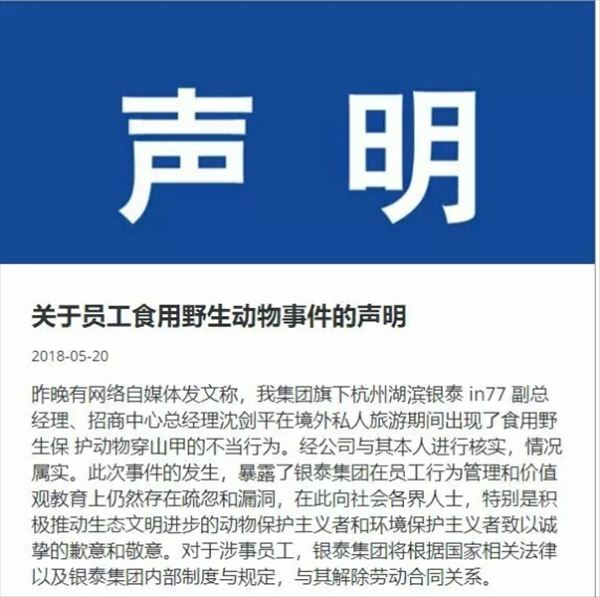 The company then issued a statement saying that the incident was true, and they would terminate the labor contract with the party concerned, and initiated their self-examination process. The manager issued a letter of apology on his personal account of the social media. After undergoing a series of social media exposure on pangolins in 2017, pangolins, which are on the verge of extinction and have listed as prohibited from international trade, have received widespread attention from the society. In 2017, it was also promoted by the joint efforts of CBCGDF, CBCGDF’s volunteers, and the media. Combined with the work in 2017, CBCGDF sets 2018 as “A Counting Year for Pangolins”. The difficult and arduous inventorying work is being pushed forward. The appearance of the incident disclosed in this news once again sounds the alarm for us. The road to wildlife conservation is still a long way to go. A manager from one of the China's major industrial investment companies lost his job after wildlife preservation volunteers discovered that he had eaten pangolin meat in Vietnam. 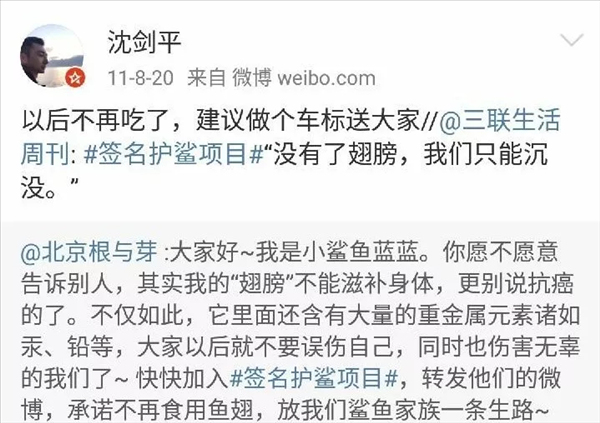 Shen Jianping, a deputy manager of Yintai Group's Hangzhou branch and manager of the company's investment center, issued an apology via social media. "It was a foolish mistake caused by my indifference to endangered animals, lack of common sense and ignorance of laws and regulations," he wrote. 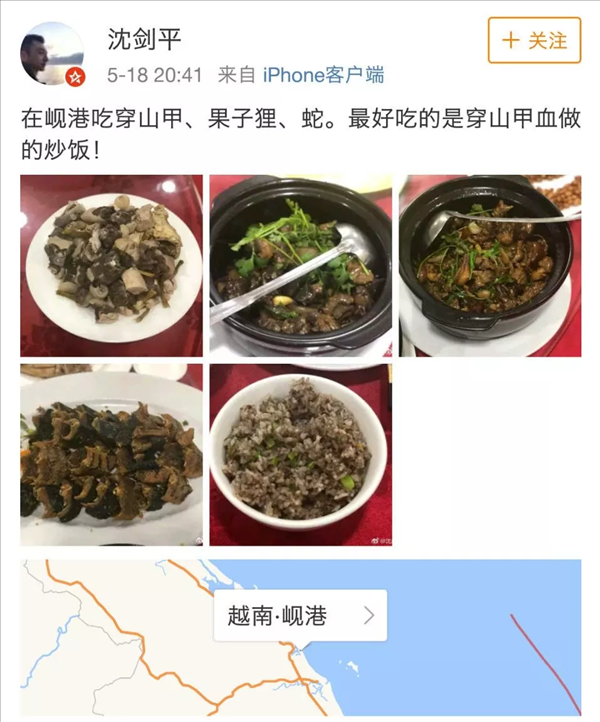 In the posting, Shen also said that it was his first trip, and a private one, to Vietnam, during which he attended a friend's dinner party in Danang last week. Pangolin and civet meat were served, Shen said, adding that he thought it was legal in Vietnam. He posted pictures of the meal online and recommended fried rice with pangolin blood, which he liked most. His posting was then reported by a volunteer from the China Biodiversity Conservation and Green Development Foundation. The pictures have since been deleted. The company dismissed Shen immediately, in accordance with relevant laws and the company's internal regulations, according to an announcement released by the group on Sunday. The company said it has launched an internal investigation to find out whether other employees have acted against wildlife or environmental protection, either during or after work. The company promises to strengthen its staff training on the environment with the help of the Yintai Foundation, which was founded by Yintai Group's CEO Shen Guojun in 2014 and is dedicated to philanthropic causes, including ecological preservation. Pangolins, which are native to Southeast Asia and Africa, are protected at the national level in China. They are also protected in Southeast Asian countries, including Vietnam. The Convention on International Trade in Endangered Species of Wild Fauna and Flora clearly prohibits any international trade involving pangolins. "Pangolins are listed in Appendix I in the Convention, which means they are extremely endangered, primarily because of illegal trade," said Wu Shibao, a wildlife conservation specialist at South China Normal University. "Many experts want to upgrade the species to first-class protected wildlife in China." In recent years, China has intensified its investigations of illegal pangolin hunting and cut off pangolin smuggling channels in the country. The wildlife protection law enacted in January 2017 strictly prohibits consumption of wildlife. Volunteers are active online and offline to raise public awareness about the need to protect the mammal and prevent any trade or killing. According to a report on pangolins in 2018 from TRAFFIC, a wildlife trade monitoring network, China and the United States have been the most common places for illegal trade in pangolins over the past six years. China used to be the largest destination for pangolin scales, while the United States was the primary destination for smuggled pangolin body parts.